On 8 May 2016 the Greek Parliament passed the much debated bill for the reform of the Greek social security system, which also contains income tax hikes, for the income generated in 2016 onwards. The new law (L. 4387/2016) was promulgated on the Government’s Gazette on 12 May 2016. Below we discuss its impact on businesses, their employees and other stakeholders. New progressive income tax scales are introduced for employees, self-employed persons and individuals deriving real estate income. The solidarity levy rates are substantially increased. The social security contributions will be gradually adjusted in order to be calculated in a unified manner, for employees and self-employed persons, from 2020. The consequence is a substantial increase of the social security contribution obligations of the self-employed persons from 2017 onwards and a gradual relief, in the coming years, for employees and for the cost of their employment. However, in the meantime, also the social security contributions for the employment income are increased by one ppt. Greece taxes the income of individuals with the application of varying tax rates, depending on the origin of the income. Specifically, a different income tax scale has been applied so far, on the one hand, to employees and pensioners and, on the other hand, to entrepreneurs. A separate income tax scale applies also to individuals deriving real estate property income. By contrast, dividends, interest, royalties and gains from the transfer of real estate property, securities or participation quotas are subject to a flat income tax at varying rates. Furthermore, a special solidarity levy has been applying to the total net income of individuals at progressive rates since 2010. The new law, apart from the changes introduced in the social security system and the relevant contributions, it modifies the brackets and corresponding tax rates of the income tax scales, which results, in most cases, to tax hikes that are magnified by the increases of the rates of the solidarity duty simultaneously introduced. Accordingly, employers will need to align their payroll systems with the new rules in order to calculate the social security contributions, the payroll tax and the solidarity levy in accordance with the stipulations of the new law. In particular, employers are obliged to calculate the solidarity levy with the new rates, starting on the promulgation date of the law (12-5-2016). As regards the new income tax scales, they apply for the income derived in 2016 onwards. We consider that whilst it seems to be clear that the withholding tax obligation must be computed from 12-5-2016 onwards with the new tax scale, the Ministry of Finance should clarify, in its interpretative circular, how the revised tax liability should be settled in respect of 2016 employment income that has already suffered withholding taxation. Employers will have also to consider, when adjusting their payroll systems, the effective dates of the changes in the social security contributions, which will be gradually implemented, starting on 1-6-2016 with the increase of the contribution rates for the auxiliary insurance fund by one ppt, borne by half by the employer and the employee. Specifically, the social security contributions will apply to the employment remuneration, the computation basis of which will be capped to a maximum amount of a monthly salary of €5,860. From 1-1-2017 through 1-1-2020 the social security contribution rates on employment income will gradually be reduced (i.e they will gradually be reduced to 20% for pension, borne by 13.3% by the employer and by 6.67% by the employee, while the contributions covering health, amounting to 7.1% of the employment income and shared by the employer and the employee by 4.55% and 2.55% respectively, will remain the same and the social security contributions for the auxiliary fund will be increased, from 1-6-2016, by one ppt to reach 7% before they start falling in 2019). The new social security rates that will apply as of 1-1-2017 to self-employed persons are 20% for pension, 6.95% for health and, as of 1-6-2016, 7% auxiliary social security (for those having already such coverage). Said percentages are reduced for those persons who are insured at ETAA (the Unified Fund of Indepentantely Employed), by virtue of a transitional provision that applies from 1-1-2017 until 31-12-2020, with a fixed discount percentage, which is decreased by 1 ppt for every additional €1,000 self-employment income generated above €13,000 and provided the annual income does not exceed 58,000. The business entities affected by the tax reform are micro partnerships and consortia, with a turnover of up to €1,5mil, which are eligible to keep single entry accounting books. These entities will be taxed for their income of 2016 onwards with the standard corporate tax rate of 29%, which is more onerous than the previous regime for micro entities whose profits do not substantially exceed €50,000, but more favorable for micro entities with higher profits (pursuant to the old regime, the first €50,000 of their profits were taxed at 26% and the excess amount at 33%). Employees are affected by the new income tax rules due to the application of the new income tax scale and the new solidarity tax rates presented above. For comparison purposes, the income tax rates for employees, under the old law, were 22% for up to €25,000 annual employment income, 32% for the part of the income between 25,000 and 42,000 and 42% for the excess. As previously, employees will maintain access to an income tax free minimum. Interestingly, the amendments in the way the relevant tax relief is calculated leads to a better treatment than before for those earning €28,000 or more and a worse treatment for those earning substantially less. Such benefit, however, is eventually evaporated due to the substantial increase of the solidarity levy rates (see table above). In terms of the way of taxation, employers will continue deducting 1.5% from the monthly payroll tax that will be calculated on the annualized remuneration with the application of the new income tax rates presented in the table above. As was the case before, such withholding tax, which applies after deducting the social security contributions of the employee, does not exhaust the income tax liability of the employee, who has to file an annual income tax return and settle by himself any difference between his annual income tax liability and the income taxes withheld or claim for refund any amount of tax excessively withheld. Regardless of their legal form, all entities are opaque for tax purposes in Greece and the profit distributions to the partners or shareholders are treated the same, namely they attract dividend withholding tax. Such tax is not final but is credited against their annual tax liability, when they are Greek tax residents or domestic permanent establishments of foreign entities to which the dividend income is attributable. Exempt from the withholding tax and any income taxation of the dividend receipts are foreign and domestic entities that qualify for the parent-subsidiary directive, as implemented in the Greek Income Tax Code (albeit a tax discrimination being still in place against the dividend income which is attributable to the local permanent establishment of a foreign company, when the distributing entity is domestic and in all cases when the distributing entity is foreign and the parent- subsidiary directive is not applicable). So far the withholding tax applied on the profit distributions has been set at 10%. The rate is now increased to 15% and applies, as before, in all other cases than when the conditions for the application of the parent-subsidiary directive are met or an applicable tax treaty provision provides for a lower withholding tax rate. To be noted that Greece implemented last month, by means of Art. 8 of Law 4378/2016 (published on 5-4-2016), the recent changes of the parent-subsidiary directive with the Council Directives 2014/86 and 2015/121, regarding the special tax anti-avoidance clause and the elimination of hybrid mismatch tax benefits respectively. Accordingly, the exemption of EU parent companies from the 15% withholding tax does not apply to tax driven structures, if they do not serve valid commercial reasons reflecting economic reality*. Conversely, the exemption from the corporate income tax of dividend receipts from EU subsidiaries will no longer apply when there is in place such a structure or when the dividend receipts are deductible for the EU subsidiary. As regards partners or shareholders who are tax resident individuals, the combined taxation of dividends and underlying profits becomes, with the new law, 39.65%, as opposed to 36.1% before. 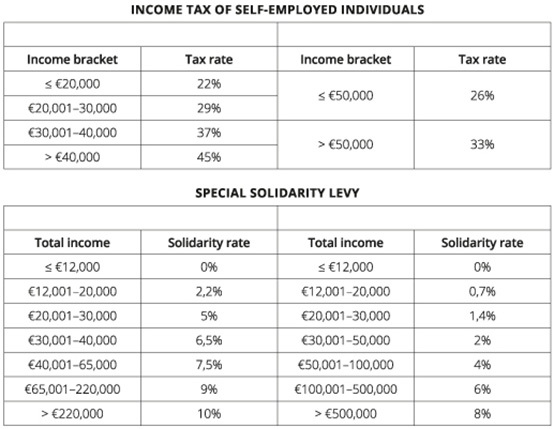 In addition, there applies solidarity levy at a rate determined on the basis of the total income of the individual (for the applicable rate, see table above). * The same restriction applies in the case of a dividend payment to a Swiss parent company, which, by virtue of an agreement between EU and Switzerland is exempt from the withholding tax, when the Swiss company holds 25% or more in the capital of the distributing company for at least 2 years, and provided there is no abuse.